May 9, 2017, 10:20 a.m.
By Laura Hazard Owen @laurahazardowen May 9, 2017, 10:20 a.m.
Is it possible to take a step back and go deep on a topic on the Internet? It should be, but the busy, crazy news cycle of the last few months has made it difficult to focus on anything for more than a few minutes. A new project, Vice News Issues, is a digital magazine-y concept that’s trying to address the issue. On Tuesday, Vice News’ homepage is taken over with a package of stories on one topic: populism. “The push on the web these days is toward individual articles. Homepages are dying. We wanted to try to bring a little more energy back to our homepage and really act like a main magazine for a day,” said Ryan McCarthy, editor-in-chief of Vice News. 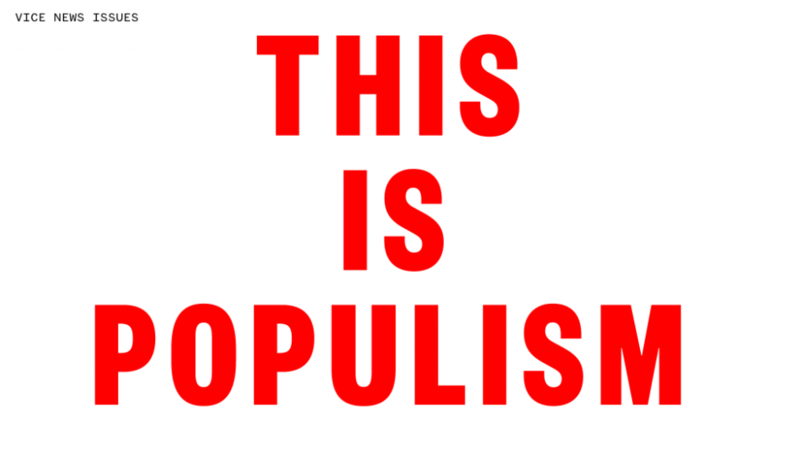 Our first topic is populism, which, depending on who you ask, is either a dangerous, anti-democratic movement sweeping the globe or the force that’s going to reclaim power for millions of citizens. To find out, we sent a novelist to the Philippines to investigate why the country supports an admitted murderer; spent time with Polish skinheads in Europe’s most homogenous country; talked with minorities in France after its historic election; figured out how populists talk; and created our own fake but arguably politically viable American Populist Party. “A lot of people will enter this from social, but we’re hoping that the visual language of design will get them to keep reading,” said Simone Landon, Vice News features editor. “There are different pieces and different styles for people to engage with across the board. We’ll also promote the package as a unit, as you would if you were a magazine doing a special issue.” People might also save the package to a service like Instapaper to read on the weekend, she suggested. I asked McCarthy and Landon how they’d thought about general interest news magazines — which for the most part have struggled terribly in the Internet age — when they were putting their package together. The idea of an online magazine certainly isn’t new, and it can be difficult to sustain readers’ interest across multiple stories or get them to remember to come back to something on a read-it-later service. POSTED May 9, 2017, 10:20 a.m.
Owen, Laura Hazard. "Vice News Issues takes a “homepage-isn’t-dead” approach to big topics (first up: populism)." Nieman Journalism Lab. Nieman Foundation for Journalism at Harvard, 9 May. 2017. Web. 18 Apr. 2019. Owen, Laura Hazard. "Vice News Issues takes a “homepage-isn’t-dead” approach to big topics (first up: populism)." Nieman Journalism Lab. Last modified May 9, 2017. Accessed April 18, 2019. https://www.niemanlab.org/2017/05/vice-news-issues-takes-a-homepage-isnt-dead-approach-to-big-topics-first-up-populism/.